The Dark Hedges, an avenue of beech trees near Ballymoney on a foggy morning. 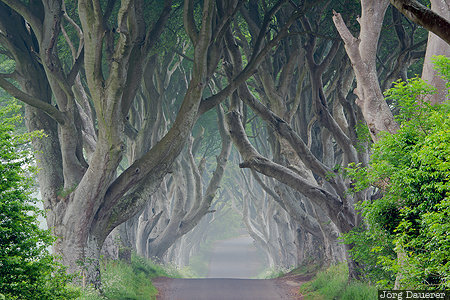 The Dark Hedges had been featured in Season 2 of Game of Thrones as the Kingsroad. The Dark Hedges are in Northern Ireland, United Kingdom. This photo was taken in the morning of a cloudy day in June of 2016. This photo was taken with a digital camera.